These days just keep getting shorter and shorter. By the time I got to the barn after work, we only ad time to ride the short trail loop again. Our of curiosity, I checked the time. The short loop is 40 minutes, which actually is a reallllly nice warmup before a ride. We rode on the trails with Sunny and Lily, and Sunny led the way on the trail back to the barn. Wizard was really easy-going about being in the middle. When we got back to the barn, we did some work in the arena. It was a pretty easy ride, walking and trotting, working on circles and looping around the jumps. We did our best to impersonate Lily’s western pleasure jog, but Wizard’s slowest trot cannot compare to her well-trained Quarter Horse gaits. 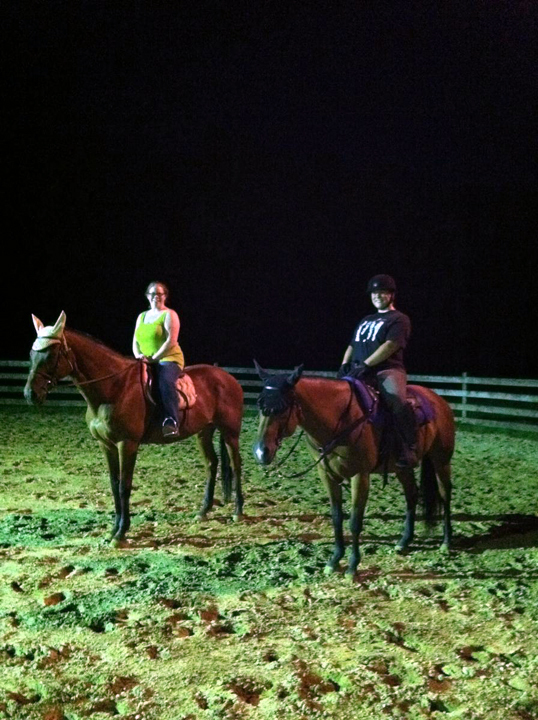 For fun, Rachel and I swapped horses. It was really neat to see her ride Wizard- I only have trusted a handful of people to ride him. They got along very well. After a few minutes of figuring out the saddle, steering, gas, and brakes, I started to get the hang of Lily, too! At first, I felt like a little kid who was just learning to ride. When I realized that it was basically like riding Wizard but in a western saddle, I did a lot better, ha ha.